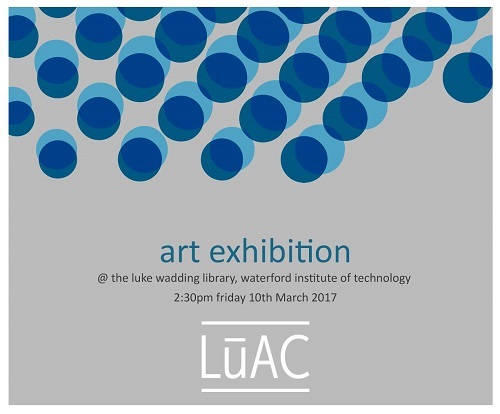 WIT LúAC In The Library is the second exhibition of 2017 for the LúAC art collective. LúAC were invited by Kieran Cronin, Developmental Librarian at Waterford Institute of Technology to exhibit in the Library after he opened LúAC’s previous exhibition in the City Library, Waterford. The exhibition stages a number of artworks that explore various ideas, such as abstract in the miniscule, beauty in the detail and taking the viewer on a journey to another place. Included in the exhibition are installation works, print, painting and photography. LúAC is a Waterford based art collective comprising of Ailíse O’Neill, Kate O’Beirne, Kevin O’Keeffe, Rosemary Dulson, Aidan Dunne and John Moloney. The collective formed over a year ago and have been continually exhibiting in galleries across Waterford and Kilkenny since then. The exhibition will run until the 7th of April 2017. LúAC look forward to sharing their art with the academic audience and also the general public. Exhibition dates: 10 March – 7 April 2017. This entry was posted on March 7, 2017 by waterfordarts in Art, Exhibition, General and tagged art collective, Art Exhibition, Arts & Entertainment Waterford, LúAC, LúAC in the Library, Luke Wadding Library, waterford institute of technology.